SPECTRUM is a suite of easy to use policy models which provide policymakers with an analytical tool to support the decision making process. Learn more about the models included with Spectrum. * Mirror links to an alternate site. Detailed instructions on how to use the software. Also includes sections on data sources, interpreting and using the results, a tutorial, and a description of the methodology. The Spectrum 5.x install file is a complete package for installing or updating the Spectrum application on your machine. 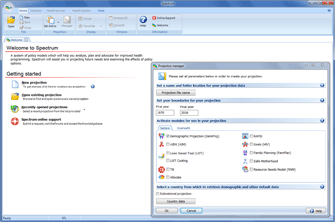 This install file includes the program application and all necessary data except for the individual demographic country files. This data can be downloaded directly from Spectrum (Internet connection required) when creating projections, or by downloading and installing the optional Country Data Package. The Country Data Package is an optional download which includes the demographic data for all countries based on World Population Prospects (WPP) 2017 as well as additional help language files. 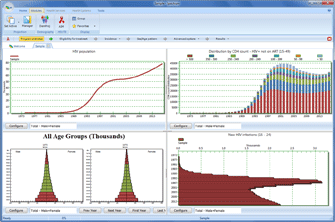 This file is considered optional since Spectrum will prompt the user to download data as needed when creating projections. The Country Data Package is useful should the user like to install all the country data during a single session or if a reliable Internet connection is not available during Spectrum usage. Since the Demographic data does not normally change, installation of data will only need to occur once and will work with subsequent installed versions of Spectrum 5.x. Due to the evolving nature of Spectrum development, the following historic versions have been preserved to ensure consistent analysis for Spectrum or the specified Spectrum module.